This is a special order item. Please allow 2-3 weeks for delivery. This item is currently out of stock. No estimated restock date is currently available. 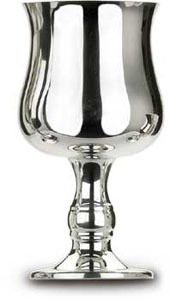 This beautiful pewter goblet is safe for all cold beverages and has a 10 ounce capacity. Made of the finest English pewter in the United Kingdom. Pewter is considered the world's fourth most precious metal after platinum, gold and silver. Its shiny brilliance gives it great value, particularly so when shaped into beautiful, usable objects such as this goblet. Unlike silver, pewter does not require polishing or any other special care. It does not rust or tarnish over time.